Some men strive for greatness. And some men find themselves thrust into the role of their nation's saviors. Such are the two heroes who reshaped and reconfigured the entire destiny of the kingdom of Scotland. Wallace the Braveheart would become the only legendary, heroic, commoner in medieval British history; the undying champion of the common man. The other, Robert Bruce, earl of Carrick, would perfect the techniques of guerrilla warfare developed by Wallace and use them to create his own place in history as the greatest king of Scots. In the spring of 1297, the two men meet in Ayr, in the south of Scotland, each having recently lost a young wife, one in childbirth and the other by murder. Each is heartbroken but determined in his grief to defy the ambitions of England and its malignant king, Edward Plantagenet, whose lust to conquer and consume the realm of Scotland is blatant and unyielding. Their combined anger at the injustices of the invading English is about to unleash a storm in Scotland that will last for sixteen years-and destroy England's military power for decades-before giving rise to a new nation of free men. 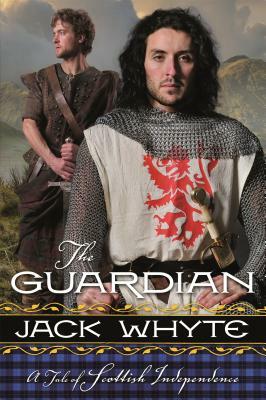 Jack Whyte is a master of the sweeping historical epic and The Guardian is the latest in his evocative chronicle of the formation of his beloved Scotland.